The weather this winter has been amazing with only a few cool days. At 7 AM today, when I left our Norfork Lake dock, the air temperature was already in the upper fifties. Early spring like weather. 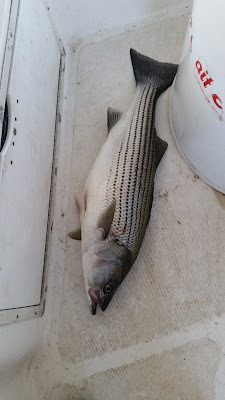 I started checking my normal winter spots and found some stripers in 90 feet of water suspended 40 - 50 feet down close to the 62 bridge. I was vertical jigging with a spoon and hooked into 2 fish but both came off after a short run. My second spot was in Float Creek. I marked a few fish lying on the bottom at 70 feet. but they would not take my spoon. I decided to try an area that I normally fish in March heading up towards the Fouts area. I was finding fish in 55 feet of water, but again I could not get them to hit my spoon. I headed into shallower water and found some schooling whites, hybrids and scattered largemouth bass in 25 - 40 feet of water. Bait was scattered and the fish were feeding. 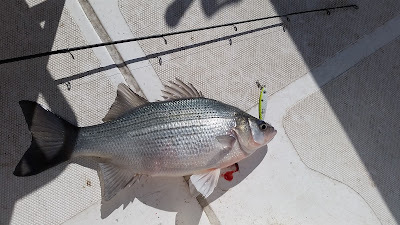 I guess the warmer than normal water temperature is moving the bait fish into shallower water and the fish are following. Unless the weather turns cold for an extended period of time we should have an early spring bite. I will try out the night bite sometime this week to see if we can get a good February bite like we had several years ago. The water temperature is almost perfect for the after dark bite throwing a suspending jerk bait. Over the last few days, I have found largemouth bass in 20 - 40 feet of water, as well as, large schools in 65 feet of water suspended 30 - 50 feet down. Look for the largemouth bass part way back in creeks on secondary points where the channel swings in close to shore. 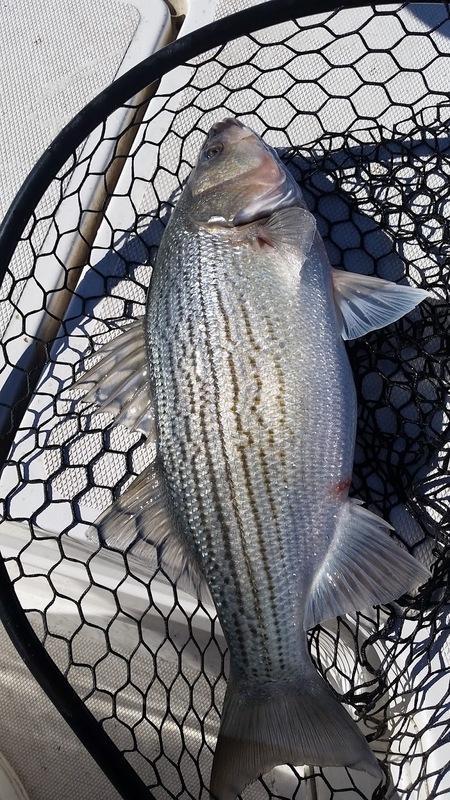 It looks like the bass are starting to transition to an early spring type bite a little earlier this year. I have landed bass on a spoon vertical jigging and by casting out a Kastmaster and letting it sink down to the depth of the suspended fish. 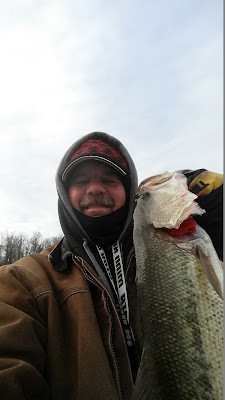 Spinner baits are also working on the wind blown banks as well as jig and pigs worked though 30 feet of water. If the weather holds, jerk bait time will start earlier than normal. The Norfork Lake water level is 547.76 holding fairly stable. The surface water temperature this morning was 48 - 49 degrees which is 4 - 5 degrees warmer than normal. The main lake is clearing and the creeks and coves are still stained, but I can see the water starting to clear.